Nutella hot chocolate is super yummy, creamy, chocolateyy drink perfect for this winter. I love Hazelnut spread just a spoonful into my mouth ends all my sweet cravings. The temperature has come down and it is chilly and windy in the evenings and the best indulgence would be a cup of hot chocolate, it is made more sinful with generous addition of Hazelnut spread. Heat milk in a pan bring it warm not to boil stage now add cocoa, sugar, hazelnut spread and stir in well. Stir continuously until the spread is dissolved and when it begins to boil switch off the heat and remove. 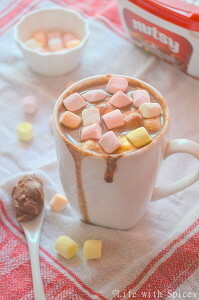 Serve Nutella hot chocolate with marshmallows on top.